Grow woad - the most traditional of blue natural dyes, extract blue pigment, dye your own wool with woad indigo & knit a blue scarf and buy woad dye! Learn more about the Woad plant (Isatis tinctoria), a famous natural dye and source of natural indigo dye, used for several thousand years (see woad history) in Europe and the Middle East. Woad dye extraction produces natural indigo dye from the dark blue-green, spinach-like woad leaves. Buy woad pigment here. “'I have been experimenting with spinning my own needlepoint wool and dyeing it with natural dyes. So far, I am having the time of my life and the wool is actually turning out well. The dyed wool is fun to use in my needlepoint projects.” Nancy from the United States. “I received woad today. Thank you!” Lyubov from Kazakhstan. Woad watercolour paint for artists back in stock! 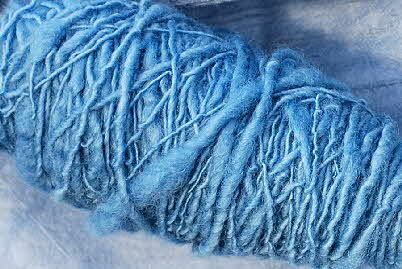 Woad dye prices reduced & available in larger quantity! Hold the Control key (Ctrl) down and press the plus key (+) at the same time, repeatedly, until the text is large enough.